Volkswagen has big plans for electric vehicles (EVs) in the next few years. But why wait to drive an all-electric VW? There are Volkswagen EVs available today! 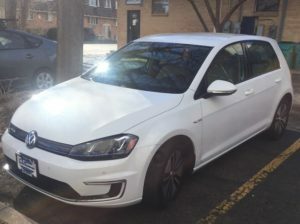 Ingrid Sheflin, a local small-business owner and brand-new EV driver, decided the Volkswagen e-Golf was just the right fit for her lifestyle. DENC sat down with Ingrid to find out a bit about her experience researching, buying, and owning a VW e-Golf. DENC: What led you to look into purchasing an EV in the first place? Ingrid: Environmental concerns were my top reason for purchasing an EV. With all of the fracking going on around us, I really want to lessen my dependence on oil. We owned both of our cars and needed to replace one, which led me to start to research the various lease deals on EVs. I figured if we were going to absorb a car payment, this would be a good time to position us to be in the EV market. DENC: What were the most important factors for you when choosing an EV model? Did your small business needs come into play? Why did you choose the e-Golf over other offerings? Ingrid: I wanted an EV that fit our family, lifestyle, and would be a good around-town car. My small business needs did not come into play as I don’t need to haul anything. I liked the e-Golf more than any other offering. I started researching and test driving the EVs and plug-in hybrid electric vehicles (PHEVs) that are in our area (for the lease deals and obviously the tax savings). I drove the 2018 Nissan Leaf, the 2018 Chevy Bolt, the 2018 Kia Niro PHEV, the 2018 Toyota Prius Prime and my now little 2015 e-Golf. 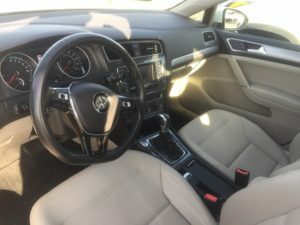 While I liked them all and thought they all had positives/negatives, the e-Golf was the most comfortable, the simplest (I am just having a hard time getting behind the big dashboards and “futuristic” interiors), seemingly the most sophisticated, and by far the smoothest. It’s so fun to drive! The Niro came in at a close second, but I wanted a full EV over a PHEV. I may keep my eye out for the all-electric Niro EV in the future. DENC: Did you decide to lease or buy the car? Ingrid: While I began my search wanting to take advantage of the tax incentives and lease deals, the used EVs and PHEVs seemed like a better value. Most new EVs seemed to me too focused on the technology rather than the quality of the car, if that makes sense. In the end, I decided on my used e-Golf and so didn’t benefit from any of the incentives or deals. DENC: Are you a single or multi-car household? Do you think the 84-mile range of the 2015 e-Golf will be sufficient for your needs? Ingrid: We are a multi-car household. We have our bigger ICE car for camping, fitting numerous kids (third-row), skiing, and long-range trips. The 84-mile range will be more than enough for our needs. I find that I only drive about 50 miles a week on average and that may be a high average. I will admit that I may get some range anxiety going to the airport, as that cuts it a little close. I’m excited to test the distance and have noticed that there is a level 3 charger just south of the 470 exit off of 25, so I could hook up to if need be! I also may just need to utilize Green Ride more than I currently do. DENC: Where do you charge most often? Do you have access to charging at your workplace? Ingrid: I have to be honest that I am so excited to use the public charging stations we have around Fort Collins – but I have only charged at home so far. The original plan was to strategically decide where to eat dinner, or have my husband drive it to work (CSU) once a week and charge there, but we haven’t tried that yet. It’s just so convenient to plug it in overnight. I do that about once a week. DENC: Do you try to charge during off-peak hours? Ingrid: I called the city and it seems like I pay a flat rate. They haven’t moved to the time-of-use system yet. I will do that when we switch over, which is coming soon, I was informed. DENC: Has charging time ever been an inconvenience, or does charging at night and/or while parked meet all of your needs? Ingrid: Completely meets my needs and then some. I didn’t plug the car in all the way the second time I charged it, so that could have been kind of hairy, but it turned out okay – complete user error! DENC: How long have you had the car? Based on your experience so far, are you happy about your decision? Do you ever wish you had gone with a gasoline-powered vehicle? Ingrid: I have only had the car a month now. I am SO HAPPY about my decision. It’s the smoothest, nicest car I have ever owned. I look forward to driving it and find myself making up errands so I can get out more. I am wondering if in a few years it may seem too small (I’m coming from a Subaru Outback) or if I’ll get used to it. That may be my only gripe, but time will tell. I don’t at all wish I bought a gas car and can say with positive certainty that I don’t think I’ll ever purchase another gas-powered car again.